It’s the last week of school in our neck of the woods. That means there are numerous year-end events: talent shows, recitals, parties, etc. See, back in September 2009, at the beginning of 1st grade, I innocently sent my son off to 1st grade with a peanut butter and jelly sandwich. He informed me that he threw it away at school because the sandwich had poop on it. I deny being a poop sandwich maker. Vehemently deny! Years of investigation have revealed that the supposed poop was a small swipe of peanut butter residue I left behind after I wiped the butter knife clean on the top piece of bread. My reputation as a poop sandwich maker lives on, though. Will has not taken a PB & J to school all year. His entire year in 2nd grade was also PB & J free. Last week I innocently inquired if I could pack a PB & J in Will’s lunch and he forbid me with unrivaled passion and conviction! This is nearly 3 years after the supposed poop sandwich incident. I’m open to suggestions for how to clean up my tarnished sandwich-maker image. How do I redeem myself? “Some wounds are too deep to heal.” Well put, Stu. Well put. Maybe I would do better to focus on the fact that my son doesn’t want to eat poop. That’s a good thing in my book. ha ha ha, this is funny. Stu’s story adds a new dimension. The only thing I can relate this to is bad OJ. I used to mix vodka and bad OJ in college together. The OJ was NOT fresh squeezed. After one particular night of vomitting I could not drink cheap OJ ever again. It stuck to this day. I sure hope your accidental ‘swipe’ of the Peanut Butter knife doesn’t leave a wound as deep as the OJ vomiting night. He must really have thought it was poop!!! Too funny! Wow, 3 years and the kid still hasn’t taken a PB&J?! I’m guessing the other kids had to have said something about the sandwhich. I bet you’re right about the other kids. I bet they think I’m a poop sandwich maker, too! I think you need to know that you have turned me off of PB&J for life! Here’s a thought. 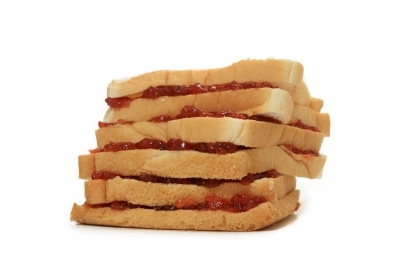 Have your son make a pb and j sandwich, make his own. Under your instruction, if needed. Use a clean knife for the pb, a clean spoon for the jelly. He will see that there is no poop involved. He can pick the type bread, the flavor of jelly, smooth or crunchy, whatever. If he creates it, he might be more interested. Just finding your blog through another blog, and enjoy it very much! I, too, am an experienced bad mom. I have THREE on which I made some of the same mistakes! Thanks for commenting! glad you dropped by. I think it would be great for him to make his own. I haven’t had a PB&J since my dad made one when I was in 4th grade, using “diet peanut butter” and “diet jelly”. (This was back in the old olden days, when ‘diet’ food used saccharine.) Except, he got distracted halfway through making it, and mixed up my lunch with my brother’s. So that day I got to school and had a sandwich that had diet peanut butter on one slice, and ham with mustard on the other. I didn’t realize this until I’d taken a large bite… and proceeded to vomit in front of everyone in my class. Wow. I’d be scarred for life, too! Thanks for sharing!